Special thanks to Dirk Gubbels for his contribution on the data type optimization part and review! (Follow Dirk on Twitter: @QualityQueries). 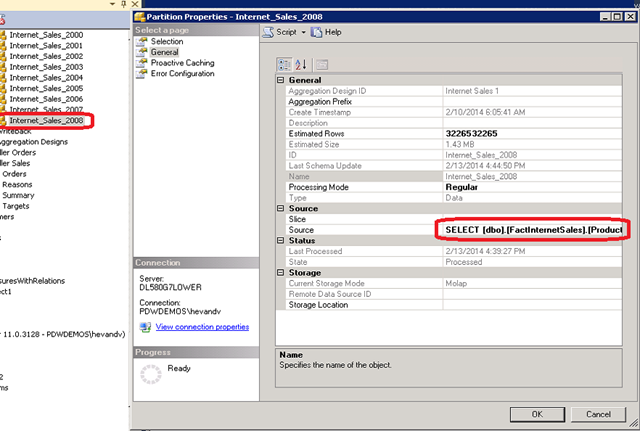 In part 1 we looked at a method to quantify the work that gets done by SQL Server Analysis Server and found that the OLE DB provider with a network packet size of 32767 brings best throughput while processing a single partition and maxing out the contribution per single CPU. In this 2nd part we will focus on how to leverage 10 cores or more (64!) and benefit from every of these CPU’s available in your server while processing multiple partitions in parallel; hope the tips and approach will help you to test and determine the maximum processing capacity of the cubes on your SSAS server and process them as fast as possible! In our search for maximum processing performance we will increase the number to reflect the # Cores by modifying the Data Source Properties. 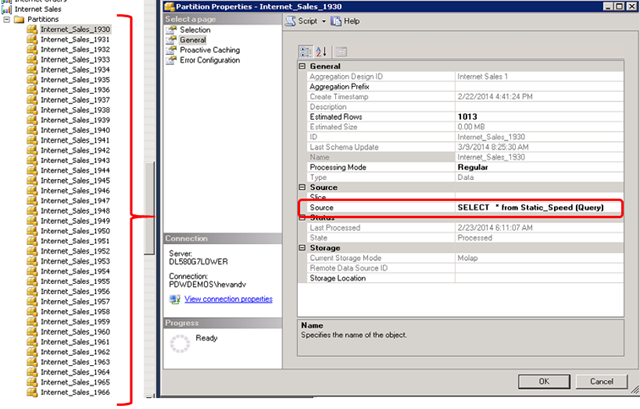 Change the ‘Maximum number of connection’ from 10 into the # Cores in your server. 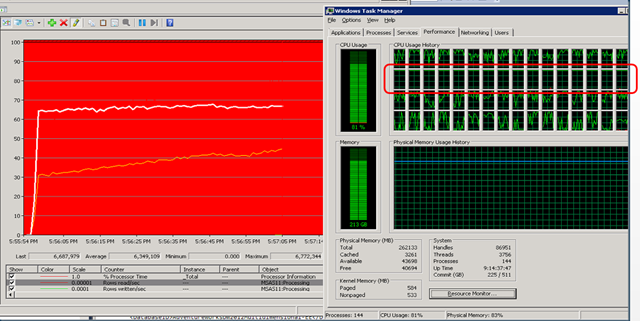 In our test server we have 32 logical- and 32 Hyperthreaded = 64 cores available. This seems a great number already but its effective (5 million rows/40 cores =) 125K Rows per core and we do still see a flat line when looking at the effective throughput; this tells us that we are hitting the next bottleneck. 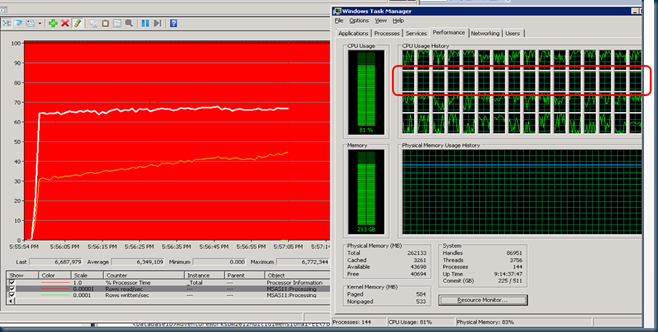 Also the CPU usage as visible in Windows Task Manager isn’t at its full capacity yet! 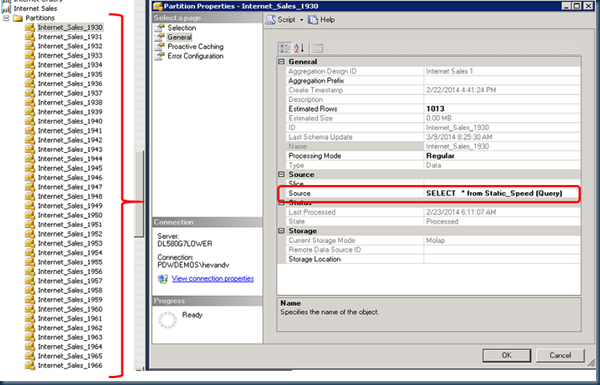 This shows an almost identical result as the profiling of a single partition in blog part I. 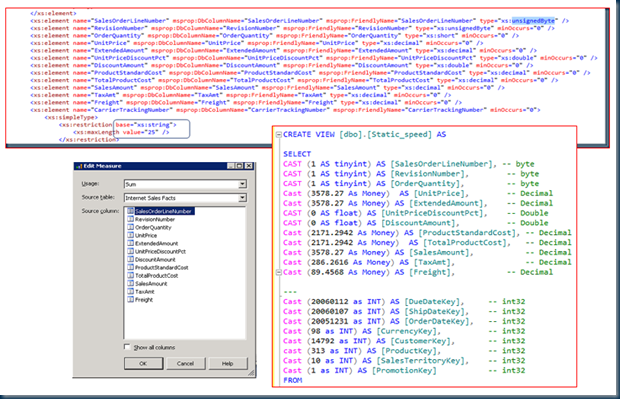 By profiling around a bit and checking on both the OLEDB and also some SQL native client sessions surprisingly you will find that most of the CPU ticks are spend on… data type conversions. The other steps make sense and include lots of data validation; like, while it fetches new rows it checks for invalid characters etc. before the data gets pushed into an AS buffer. But the number 1 CPU consumer, CDataSource::DataConvert is an area that we can optimize! 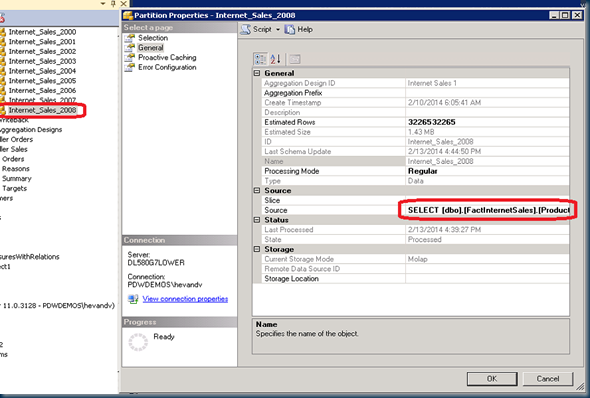 This is an important topic; if the data types between your data source and the cube don’t match the transport driver will need a lot of time to do the conversions and this affects the overall processing capacity; Basically Analysis Server has to wait for the conversion to complete before it can process the new incoming data and this should be avoided. 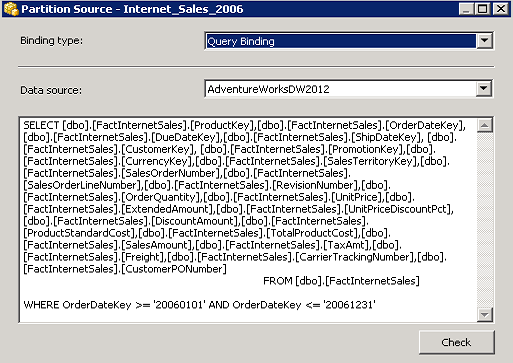 By looking at the table or query that is the source for the partition, we can determine it uses a range from the FactInternetSales table. But what data types are defined under the hood? 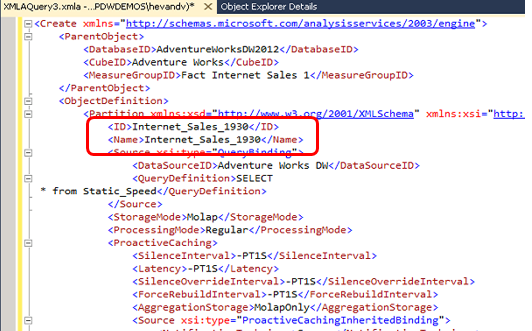 To get to all data type information just ‘right click’ on the SSAS Database name and script the entire DB into a new query Editor Window. 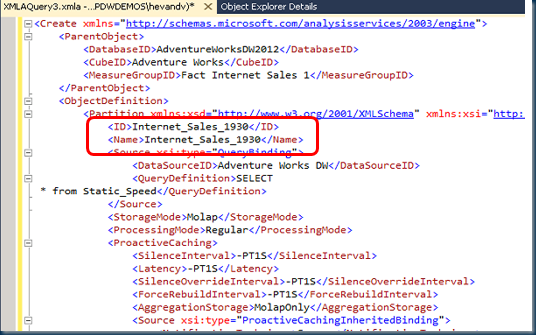 Search through the xml for the query source name that is used for the partition, like: msprop:DbTableName="FactInternetSales"
These should match the SQL Server data types; check especially for unsignedByte, short, String lengths and Doubles (slow) vs floats (fast). 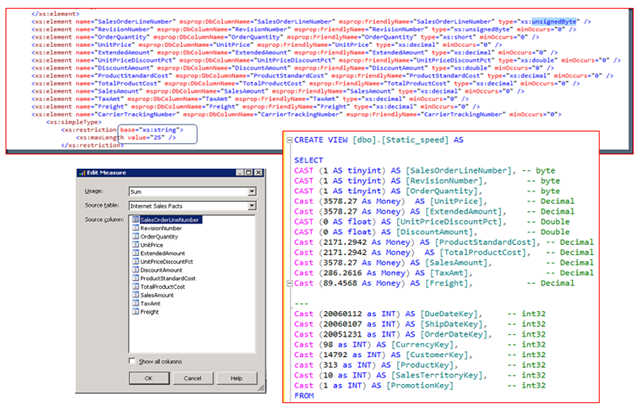 (We do have to warn you about the difference between an exact data type like Double vs an approximate like Float here). A link to a list of how to map the Data types is available here. How can we quickly check and align the data types best because to go over them all manually one by one isn’t funny as you probably just found out. By searching the net I ran into a really nice and useful utility written by John Tunnicliffe called ‘CheckCubeDataTypes’ that does the job for us; it compares a cube’s data source view with the data types/sizes of the corresponding dimensional attribute. (Kudos John!) But unfortunately even after making sure the datatypes are aligned and running Kernrate again shows that DataConvert is still the number one consumer of CPU ticks on the SSAS side. Maybe as best-practice CAST all columns even if you think the data types are right and exclude also the ones that are not used for processing the Measure group from the View. 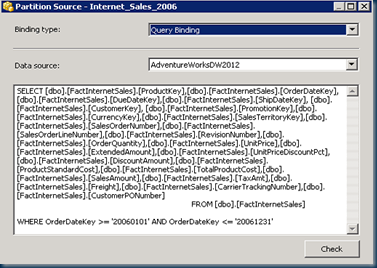 (For example, to process the FactInternetSales Measure Group from the AdventureWorks2012 DW cube we don’t need [CarrierTrackingNumber], [SalesOrderNumber], [PromotionKey] and [CustomerPONumber]) ; every bit that we don’t have push over the wire and process from the database source is a pure win. Just create a view with the name ‘Speed’ like to give it a try. (Note: always be careful when changing data types! Result: by using the data type optimized Speed view as source the total throughput increased from 5 to 6.6-6.8 Million rows Read/sec and 4600% CPU usage (== 147K rows/CPU). That’s 36% faster. We’re getting there! If you would like to take the database performance out of the equation something I found useful is to create a static view in the database with all the values pre-populated this way there will still be a few logical reads from the database but significant less physical IO. 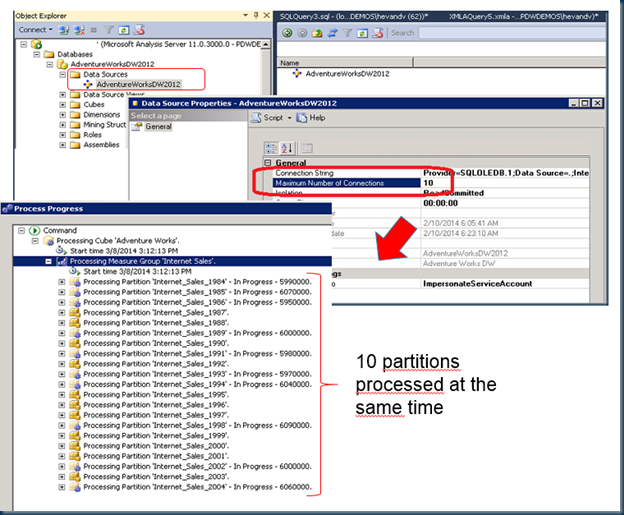 Create multiple new partitions from it by just changing the <ID> and <Name> ; these will run the same query using just the static view. This way you can test the impact of your modifications to the view quickly and at scale! 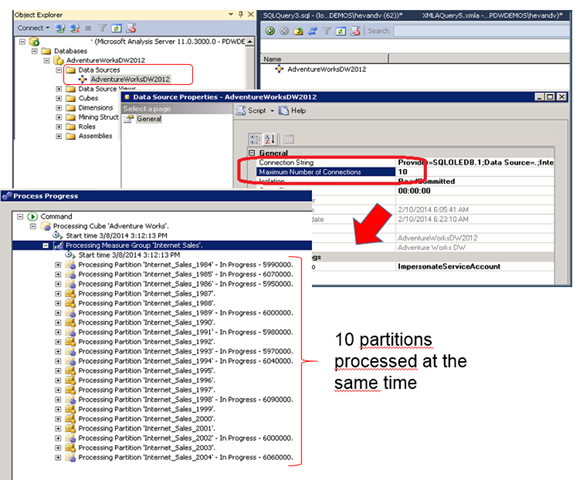 Process all these newly created test partitions who will only query the statics view and select as many of them or more as the number of CPU’s you have available in your SSAS server. by monitoring the ‘Rows Read/sec’!